Beloved Spear: Chapter Five: A Strawberry Theology: “Small” and Fruitful. Chapter Five: A Strawberry Theology: “Small” and Fruitful. The assumption, of course, is that in order to be faithful, we must grow. Go out and make disciples of all nations, we are told. Faith is like a mustard seed, we are told, so the only way for a little thing to be legitimate is for it to grow into a huge thing. We take the images of harvest, of fields yielding tenfold, a hundredfold, a thousandfold, and then we take a hard look at our own little fellowship. Where are we? We’re in that little rural church that gathers faithfully in a place where the population is in decline. We’re that small house church that prays and shares and serves together. We’re that storefront in a blighted Southern town. And we’re not adding to our number. If this is your life of faith, those texts can be thrown up into our faces, as evidence that we are neither faithful or fruitful. Just stop existing, our culture of growth says to us. Just get out of the way, and let your sad, miserable little excuse for a community go to churches that are actually doing something. Well, it doesn’t tend to be as mean as that, but it’s certainly implied. And yet, as we look to the great and sacred narrative of scripture, what we find is that while growth is valued, it is not valued in the same way that our culture values it. The growth that matters is not invariably numerical. In point of fact, the Bible offers us numerous visions that affirm a smaller, more intimate approach to our faith. It was not because you were more numerous than any other people that the Lord set his heart on you and chose you--for you were the fewest of all peoples. It was because the Lord loved you and kept the oath that he swore to your ancestors. Here, written into the Torah, we find a reminder to the people of Israel that the basis of their covenant relationship with YHWH isn’t their size or their power as a people. They weren’t an empire, after all, nothing at all like Egypt or Assyria or Babylon. They were small potatoes in the Ancient Near East, a people so negligible that the real powers around them didn’t even notice the “height” of Israel under David and Solomon. Compared with those sprawling empires, even the greatest aspirations of the Hebrew people weren’t much of anything. They knew this, and yet still stood in authentic covenant relationship with their God. This is the very large God of a small, vulnerable, often-kicked-around people. The experience of getting repeatedly invaded and routed by much larger and more powerful nations may well have been what lead the people of Israel to develop their theology of small, a theology that is perhaps best described as a “remnant” theology. Then I myself will gather the remnant of my flock out of all the lands where I have driven them, and I will bring them back to their fold, and they shall be fruitful and multiply. I will raise up shepherds over them who will shepherd them, and they shall not fear any longer, or be dismayed, nor shall any be missing, says the Lord. What matters to the Prophet, and by extension, to God, is not strength or glory. What matters is the faithfulness of a people. They haven’t been selected for their strength, or for their evident prosperity. It is their faithfulness and their endurance that matters. On that day the remnant of Israel and the survivors of the house of Jacob will no more lean on the one who struck them, but will lean on the Lord, the Holy One of Israel, in truth. A remnant will return, the remnant of Jacob, to the mighty God. For though your people Israel were like the sand of the sea, only a remnant of them will return. Destruction is decreed, overflowing with righteousness. Within this remnant theology, it is important to see the encounter of those who feel powerless with the powers of their age. It is doubly important to be reminded that those powers--like the vast empires of Assyria, Babylon, and Rome--are as fleeting as the mist. Those great and grand works are just not particularly impressive to the Creator of the Universe. For smaller communities weary of our culture’s repudiation of their worth, these texts can be vital and affirming. But let it be said--small congregations often deeply underestimate their worth. It isn’t simply that we can endure hardship. Being small has advantages. Strengths, even, that the largest of congregations genuinely struggle to replicate. One of the challenges of the “remnant” church is that narratives of survival can become stories that trap a gathering in the past. Those who remain choose to focus on what was, and become so trapped in the “good old days” that they have no real life in the present. It becomes an impediment for the real challenge at hand. As smaller congregations wrestle with the limitations inherent in their size, this text reminds us that it is what is within that matters. God’s interest is, again, not the degree to which we’re visibly strong or honored by our culture. It’s how we are internally. For individuals, that’s a reflection of our psyche--our soul--and our relationship with God. For communities, it is the “spirit” of our church, that strange ineffable character that a gathering of human beings develops as they live out common life together. In addition to that strength of spirit, the story of David that is front and center for any conversation about small and large is that old but valuable chestnut from our Sunday School years: the story of David and Goliath. Whatever one may believe about the historicity of this battle between a sling-wielding adolescent and a towering, boss-battle giant of a man, the themes within this narrative are clear. First, we hear that the young David--having volunteered to take on the giant Goliath in single combat--is offered the weapons and armor of an adult man. But he’s still a kid, and when he tries to put on the bronze armor and carry the sword that Saul offers him, he finds he can barely walk under the weight of the armor. That, and he has no idea how to make effective use of a sword. He sets them aside, and chooses instead to use tools more befitting his size, stature, and skillset. He takes the weapon of a shepherd...a sling and stones. With them, he can strike from a distance, keeping himself away from fangs and claws...and spears, even ones with a haft as thick as a weaver’s beam. He also takes the armor of a shepherd: his agility, his flexibility, and his ability to move. This, for the small church, is an important lesson. In a land teeming with giants, it might be tempting to look to how they act and how they function, and do what they do. This is a mistake, as David realized. If you in your smallness try to mimic the patterns and strengths of giants, you’re going to get your hat handed to you with your head still in it. Smaller churches, by virtue of their size, have unique opportunities for vital functioning in some areas that are not normally open to larger churches..intimacy, caring, and support; opportunities for the development of mutual ministry of clergy and laity; opportunities for significant intergenerational experiences; and opportunities for mission in the community. Here, though, it’s equally important to take the story of David and Goliath with a grain of grace’s salt. Sure, the growth and expansion of megachurch Christianity and our theologies of the large have had a significant impact on community and neighborhood churches. In many ways, it’s worth resisting the growth of the ecclesiastical monoculture that these often-uniform congregations have created. But if we get too far into the martial metaphors, we can start viewing larger communities as inherently negative, as being such a part of the world that they’re no longer really places where the Kingdom is articulated. This is dangerous, because it sets us up as being too aggressively negative towards large and corporately sized communities. The goal of the small church is not to stand in an adversarial relationship with the big church. We’re not trying to lob our sling stone into the tanned forehead of Joel Osteen, as tempting as that may be. Our primary goal is to to fulfill our place in the ecology of the Kingdom. We are different. Our gifts are different, our role is different, and our strengths are different. If all were a single member, where would the body be? As it is, there are many members, yet one body. The eye cannot say to the hand, “I have no need of you,” nor again the head to the feet, “I have no need of you.” On the contrary, the members of the body that seem to be weaker are indispensable, and those members of the body that we think less honorable we clothe with greater honor, and our less respectable members are treated with greater respect; whereas our more respectable members do not need this. But God has so arranged the body, giving the greater honor to the inferior member, that there may be no dissension within the body, but the members may have the same care for one another. If one member suffers, all suffer together with it; if one member is honored, all rejoice together with it. While this is typically used to describe our individual giftedness within the dynamics of the whole faith community, it has something important to teach us about the interplay between communities. Every individual has a gift they can bring to the community, and every community has a potential giftedness to bring to the whole. Just as it is spiritually dangerous to view small churches as inherently unfaithful or inferior, so too it’s dangerous for those of us who love smaller communities to automatically assume that larger churches are inherently flawed. It’s tempting, very tempting. If you were cheering along in the prior chapters during this book’s deconstruction of the ethics of corporate/consumer growth, its very easy to transition from that to a form of bitterness or resentment. We can assume, wrongly, that nothing good ever happens in those sprawling Jesus MegaCenters. As the case study in the previous chapter revealed, even the largest and most carefully choreographed megachurch can convey the message of the Gospel. It is entirely possible. Rather than give in to the easy siren song of resentment and opposition, it’s important to acknowledge that those congregations that tower like Colossus over the world can be bearers of Christ’s gracious message. What small churches can offer may be better, sure. We provide authentic human relationship, organizational agility, less focus on building and salary, and fewer worldly distractions. But though we’re stronger and more robust, we must have patience with those poor, spiritually-weaker megachurches, and acknowledge that they, too, have an important part to play in God’s kingdom. What is that “best?” It’s our ability to live close in community with one another. It’s our capacity to share the relationships and intimacy that come from close conversation, from the sustained knowledge of one another that time and togetherness can bring. We hear much about the teachings of Jesus, about how he spoke in ways that often fuddled and confused his first-century listeners. When the throngs gathered to hear this wonderworker speak, they undoubtedly caught that excited hum that we all catch as social creatures when there’s excitement in the air. But more often than not, they left not entirely understanding what it was that they’d heard. As we read in the thirteenth chapter of Matthew’s Gospel, the teachings that came in parables were intentionally challenging, designed to force you to pay attention and use your imagination. And if you still didn’t get what Jesus intended, the place where an answer was sought was not in the din and shouting and excitement of the crowd. For that, you needed to be part of a small circle, a space in which questions can be asked and answered, and conversations and relationship can grow. Small communities offer up opportunities for that kind of richness, and it is in that place that discipleship really grows. So from these passages and quotations, what do we have? We have the scriptural and theological essence of what it means to live in a fruitful, life-giving small community. We hear that God loves the small and the faithful, even if they are struggling. We see, in story, that if we’re a little David church, we shouldn’t try to be something that we’re not. We hear affirmed, in Paul’s understanding of the nature of Christ’s body the church, that the different gifts of those perceived as “weaker” are just as vital. And we know, from Christ’s own teaching, that small gatherings are often the place where the richest knowledge of the Gospel resides. Too many small churches have failed to do their theological homework. They’ve missed the fact that God has historically chosen to work through small remnant groups. They weren’t paying attention when Martin Buber taught us that the I-Thou relationships found in intimate caring groups of people are the kind of relationships prized by God and characteristic of many small churches. They didn’t understand Reinhold Niebuhr’s premise in Moral Man and Immoral Society that the larger the grouping the more immoral and self-serving its attitudes and behavior tend to be. Paul Tillich taught us that the essence of sin is separation, yet we fail to recognize that life in larger groups tends to be more impersonal and fragmented. 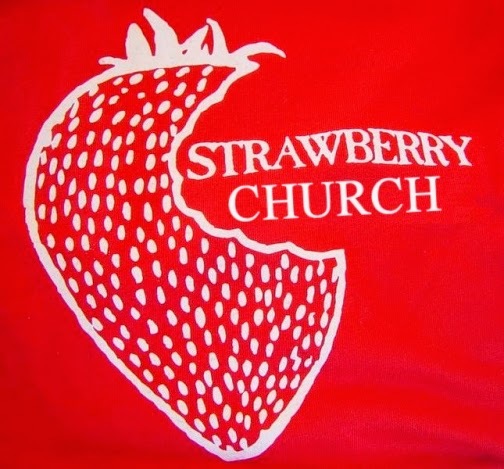 Small is beautiful in the eyes of God, and realizing that is the key to finding our confidence in strawberry churches. So we’ve looked at a giant church, a great and glorious behemoth. Let’s look at a wee little kirk, now, why don’t we? One of the theological/scriptural approaches suggested as a way of honoring smaller fellowships is the idea of a “remnant” faith. How can this be a source of strength for counterculturally small gatherings? In what way can this become an impediment to a fruitful spirituality? Another scriptural story referenced in this chapter is the tale of David and Goliath. David’s strength, and the reason he wins the fight? He’s willing to use his small size to his advantage. If you’re in a small community, are you “agile?” Do you use the gifts of your community size to your advantage? If so, how? If not, why not? A third scriptural concept comes from the Apostle Paul, who reminded Christians that every person has a different gift and role within the body of the church. Does extending this image to congregational life work? If so, what are the particular “gifts” of your church or Jesus-gathering? How are you part of the larger work of the body of Christ? One of the pull-out quotes in this chapter cites small-church experts Stephen Burt and Hazel Roper. In it, they suggest that little churches need not to “try too hard.” How does this concept feel as you wrap your brain around it? Shouldn’t we always be striving? What do you think they mean by this? In the last pull-out quote, David Ray references Reinhold Niebuhr. A quote within a quote! How meta! Anyhoo, the reference is to Moral Man and Immoral Society, a classic Christian work that notes the inherently self-serving character of both nations and large organizations. Are larger organizations inherently less willing to be self-sacrificing? If so, why might that be?